Clinton, with former Iowa Gov. Tom Vilsack, at the Iowa State Fair last week. DES MOINES, Iowa (CNN) - Whether or not the presidential campaigns will openly admit it, the past couple of weeks in Iowa have been tougher than usual. In the past three weeks, the Hawkeye State saw the first round of Iowa debates, the Republican straw poll, an AFL-CIO Democratic forum and the Iowa State Fair. The fair, which ran over the course of 10 days, was neutral territory for the Republican and Democratic presidential candidates as they toured the grounds shaking hands and indulging in such delicacies as fried Twinkies or pork chops on sticks. "These debates here in Des Moines at the same time as the state fair roughly intensifies the appearances of all these candidates," said Dennis Goldford, a professor of politics at Drake University in Des Moines. "That may be perhaps coincidentally a little out of the ordinary." On the days preceding these events, campaigns were no doubt prepping from sunrise to well after sunset. So it's time for a break, right? Not necessarily, say the staffers. Ask anyone involved with an Iowa presidential campaign and you'll hear one very similar response: there's never time to rest in the realm of a presidential campaign. "It was obviously a very busy week, but we're always busy here," said Dan Leistikow, Iowa communications director for former Democratic Sen. John Edwards' campaign. "People are still working very hard." Jim Kersten, a co-chair for Republican Rudy Giuliani's Iowa campaign, said, "We are just working hard, like all the campaigns in Iowa." And they're probably right - campaigns really can't take vacation time. But does the chaos at least return to some kind of normalcy now that most candidates have left the state for a little while? "There is no normal on a campaign," said Leistikow. "Normalcy for us is lightning's pace," said Mark Daley, the Iowa communications director for Democratic Sen. Hillary Clinton's campaign. "We work as hard as we can. It's late to bed, early to rise." Josh Earnest, Democratic Sen. Barack Obama's Iowa communications director, said, "If your definition of normal is having 29 offices all across the state, staffed 12 to 14 hours a day...then I guess it's going back to some measure of normalcy." Chuck Larsen, a senior adviser to Republican Sen. John McCain's Iowa organization, said, "Iowans will really start to focus on the race in September, so now is where the rubber hits the road." But as reluctant as most campaigns are to admit it, a little "R and R" is not unheard of, even in the perpetual motion of Iowa caucus politics. Republican Sen. Sam Brownback, who finished third in the GOP straw poll, took the week off following the state fair, and his Iowa communications director John Rankin said, "The staff workload eases a bit when he doesn't have public events." Democratic Sen. Joe Biden, one of the last remaining Democrats in the state following Sunday's debate, admitted he'll put his feet up for a bit, though his Iowa staff contends they themselves will not. "I'm home Saturday," Biden said with a grin. And while Biden is home, Obama's entire Iowa staff will be at an out-of-town retreat. Earnest said the purpose of the weekend retreat is to make sure they're all "on the same page for the fall." Clinton's Iowa campaign will also let some of their staff relax, sans any type of statewide retreat. Daley told CNN, "I'm sure we have some people off but we have a ton of surrogate events this weekend as well." Eric Woolson, former Republican Gov. Mike Huckabee's Iowa campaign director, said the weeks leading up the straw poll were as busy as they've ever been. But now, even in the midst of trying to capitalize on Huckabee's surprise second place finish at the straw poll, they've been able to enjoy some time to re-group. "We had an opportunity to catch our breath," said Woolson. "It's really a chance to step back and enjoy the results of that hard work." Woolson said most volunteers and staffers work all the time, but with a smile he added, "I took a few days off just because I'm old and tired and needed a few days off." The campaign of former Republican Gov. Mitt Romney, fresh off their first place finish at the straw poll, also took time off - albeit not much. "[We] kind of decompressed and took it all in," said Tim Albrecht, Romney's Iowa press secretary. "That's important because we had worked so hard and achieved such an overwhelming victory that we were able to take a break, take a rest on that Sunday." Former Republican Sen. Fred Thompson did not officially participate in the straw poll but did, however, make a stop at the state fair. His "Testing the Waters" committee declined to comment on what the following week has been like. Leistikow at the Edwards' campaign, while maintaining their offices have "remained open" through it all, said that "staff members have taken different days off." Taylor West, Iowa press secretary for Sen. Chris Dodd's campaign, said, "You've got to give folks a little bit of time to decompress, but obviously we try to stagger it out so that we've always got plenty of people crankin' away." And perhaps it's best to get that decompression time in while they still can. "This is the 'pre-campaign,'" Professor Goldford cautioned. "We'll see the real intensification coming this fall because we still have a good four months before those caucuses." I am trying to resist a trite comment about Shrillary "flipping", so I'll just note the appropriateness of the slogan on her apron. pl, at the UN, for a while. I am not American. I cannot vote. Glad to see, once again, Ms Rodham-Clinton cook....again. Can you remember the time when the then First Lady was in the kitchen at the White House cooking an omelet for Chelsea who was ill? The cooking staff, of course, was scurriling to offer help. The First Lady's response?... "don't be upset, my doughter does not want any omelet, she wants mine". I’ve got nothing against Iowa. I’ve never been there, but it seems like a nice enough place. One is that the demographics of Iowa don’t really represent the rest of the nation very well, (Iowa was 96.14% white in the 2000 census). The other is that the system forces candidates from both parties to pander to Iowa’s local concerns, (in particular ethanol subsidies). We really need to set up national regional primaries and take this disproportionate political power away from Iowa, (and New Hampshire and South Carolina as well). I’m tired of having excellent candidates eliminated from the race just because voters who don’t share my values get to vote before I do. Does that seem fair to you? Democrat and Republican hypocrisy at its finest! I say impeachment for all GOP leaders will create justice for all American citizens. Let the US citizens repeat ourselves. Calling for President Gorge W. Bush’s impeachment for starters than empty the monkey barrel of congress and shoot them all, prior to GWB ending term as President will prevent his administration in starting some new upset with countries like Pakistan or Iran and their governments. So that GWB is not leaving the US with another mess too delete, cover up and/or for others to clean up after he is gone. If there will be anything left to clean up! Go though his life pilfering right now and pay no mind too executive privileges! Bush should be sitting along side with his buddy “Dickey Boy” along with all our members of Congress and the terrorist thugs should be rounded up; all placed in securely in one place in Guantanamo bay prison liken to a piffling heard of swindling, perverted seductive thieves them people really are. Oh yea! Senator Hillary Clinton also. Never have I witnessed in the history of America have our legislators been more out of touch with what is important to American citizens’. Never in the history of this country have our lawmakers so brazenly and deliberately set out to pass legislation that is destined to cause harm to US American citizens. Never in the history of the United States of American has our citizenry been more disappointed with the people they have voted for and sent to Washington D.C. "The grim truth is that the political leadership of the country, especially in Washington D.C., is absolutely dysfunctional in grappling with any issues..."
Well, shuck-e-darn......ya'll from North Carolina down there don't realize that "Sweetheart Clinton" would tell ya'll to git yer own dam* beer yerself, 'cuz ya got 2 good legs to walk on.......now ain't that right? Uh, what I MEANT to say is, no GOP candidate can touch Clinton–(except MAYBE Schwarzeneger....[however you spell his name], and he can't run). I don't feel that the mightiest military in the world will flourish under Hillary Clinton. We must kick a&* in the Middle East (OK Im not politically correct, but c'mon these terrorists are nuts, people.) And Hillary does not inspire strong, decisive military action. I respectfully disagree, Hillary Clinton is not the strongest democratic candidate by a long shot in my opinion (She would be my third choice). She criticizes opponents for saying things she says herself. She makes mistakes and then does everything to make excuses for them or blames the Republicans for them. There is no chance for national compromise with her, no way to reach out to the other side. She's no Bill Clinton, and she is not a stong enough leader. She is a supreme politician in the same weary politician mold we've seen for some time now. She's a great Senator; she would be a competent but marginally effective president. We can do better. FYI: The AFL-CIO debate took place in Chicago, not Iowa. The article states AFL-CIO forums not the AFL-CIO debate .. and the AFL-CIO did hold 2 democratic forums on in Cedar Rapids, IA on 08.18 and one in Waterloo on the previous Wednesday. I thought the "I know whats best for you progressive thinking Democrats" were against anyone eating what they want to in regards to transfats and all that bad stuff? Fried twinkies and pork on a stick? Didn't they make that against the law in some states? Then when the people get fat, trial lawyer Edwards can sue Hostess and Swifts premium for allowing the people to buy the products, eat it and get fat. When the people no longer have to work because of the settlement, Richardson can have the illegals come in and do the work that Americans don't want to do. In response to Tom Dedham (sorry if I got that wrong), the transfat bans have been spearheaded by the REpublicans in Connecticut, Dems dont think issue is important enough...check ur facts. If as Hilary Clinton states "So I think I'm the best of the Democrats to deal with that as well" then America truly is in serious trouble. To vote for Hilary Clinton would be the worst mistake any reasonably conscious individual could ever perpetuate upon him/her self while bring America to further demise. Only a fool would believe as Hilary says, "It's a horrible prospect to ask yourself 'What if? What if?' But if certain things happen between now and the election, particularly with respect to terrorism, that will automatically give the Republicans an advantage again, no matter how badly they have mishandled it, no matter how much more dangerous they have made the world," when Hilary as did so many other Democrats, she voted for the war in Iraq and against taking a stance against illegal immigrants as well as other domestic issues that would have benefited American. To place sole blame on the Republicans is merely a demonstration of the democrats’ lack of an agenda and Hilary Clinton’s arrogances and lack of respect for the America people. This campaign is getter worse the further along it get using God in the manner Obama has. Hypocrisy to get votes is the lowest any candidate can get and Obama is there! However, he is right quoting and yet he does not demonstrate the love of Christ accompanying those words: "He said, whoever hears these sayings of mine and does them, I will liken him to a wise man who built his house on a rock." "The rains descended, the floods came, and the winds blew and beat on that house. But it did not fall, because it was founded on the rock," However, is Obama mindful of the totality of the teachings of Jesus as Paul reminds all of and found in 2 Timothy 3 when he openly supports homosexuality wherein Jesus does love the sinner but in no uncertain terms hates the sin that Obama and the church he attends has openly supported? Obama needs to with prayer and fasting truly study the Sermon on the Mount before attempting to use God ever again for his only agenda; only a hypocrite would do such a thing. What a great photo. 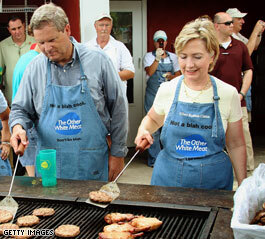 Hillary's handles a spatula about as good as Bill handles marital fidelity. NY, MA, Chi-town, NJ etc, etc and other states and cities have all had these trans fat bans spearheaded by a huge majority of Democrats. IF there is a Republican doing this, they are equally WRONG and wholly socialistic in telling people what to eat. Is someone going to start doing an inventory of cabinets and fridges? We even had a Democrat who wanted to ban fluffernutter from school.